My redesigned website (courtesy of the talented Kendra at Creations by Kendra) is live. I'd love for readers to take a look, and email me (through the website) with any corrections. I'd be thrilled if you let me know whether links don't work, graphics don't load, screens are unreadable, or if there are typos. Interviewing Virginia Kantra at Chatelaines--win a free copy of Sea Lord! I’d like to welcome the fabulous Virginia Kantra to the Chatelaines. 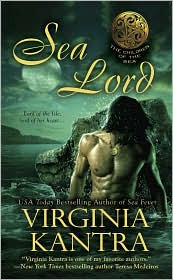 Her current release Sea Lord is the third in her Children of the Sea series. If you haven’t checked out this lush paranormal series yet...why the heck not? They’re some of the best-written books I’ve read in a long time. Click over to The Chatelaines (http://www.thechatelaines.blogspot.com), check out what she has to say about her books, and win a free copy of Sea Lord. It looks like Madness of Lord Ian is available on Kindle!!!! Some updates: The publication date for Pride Mates has been moved to Feburary 2010. Don't blame me--I already turned in the book! Pub schedules get moved for a variety of reasons. For now, the date is FEB 2010. I don't have pub dates yet for the next three books in Ian Mackenzie's series. I hope to announce those soon. 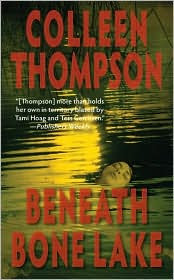 I'm happy to welcome one of my favorite Romantic Suspense authors to the Chatelaines: Colleen Thompson, fellow Leisure author, whose new novel Beneath Bone Lake hit the shelves this Tuesday!! We'll be doing a giveaway--comment on the interview or Colleen's books and enter a drawing for her RITA nominated book, Triple Exposure. JA - Colleen, congrats on the release of Beneath Bone Lake! Can you tell us a little bit about it? Please go to http://www.thechatelaines.blogspot.com to read the rest of the interview and comment to win! !